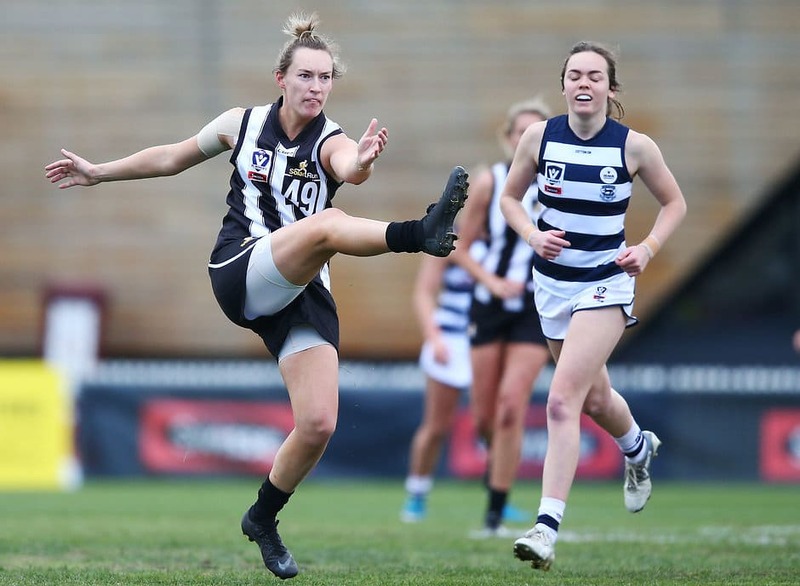 Forward Sophie Alexander will make her AFLW debut for Collingwood on Saturday night, but her journey to the competition and Geelong's GMHBA Stadium was a more difficult one than many of the players she will share the field with. The story of how she emerged from those tough times – admittedly still with some way to go – centres on the support of her family and friends and finding structure through work and football. And a dog named Angus. New Magpie Sophie Alexander never had a full-time job until recent months. This wasn't a case of dole bludging, taking extended overseas holidays or being absorbed in her studies. Alexander, 25, simply couldn't commit. Unbeknown to many of her family, friends and Collingwood teammates, the talented forward was diagnosed with depression and anxiety in 2013. There were times Alexander wouldn't leave her bed for days on end, preferring to be lost in dreams that protected her from the "hell" of her daily existence. "My illness hasn't come from any personal trauma or anything. It's just a chemical imbalance," Alexander told womens.afl. "It's like another thing attacking you – it's really hard to explain. For those five years; it was just about getting through the day or the week and hoping the next week might be better. "I've still got a long way to go, but I've never really thought about that I've held down a job for the last couple of months. It's the little things you don't celebrate that you should." Alexander delayed telling her parents, Mandy and Rhys, who she lives with in Ballarat in north-western Victoria, about her diagnosis for roughly 12 months. The reason? She felt she was letting them down after a self-professed idyllic childhood where she was wanting for nothing. "It's very hard. You question yourself a lot, like 'How did I miss it? What could I have done differently?'. All those things," mum Mandy said. "I'd probably ask more questions sooner rather than later (if I had my time over) – don't sit and wait for them to come to you. I knew something was going on. "I used to get angry that she stayed in bed a lot … I just thought she was being lazy. "So, be aware what the signs are. Don't assume they're being lazy and a typical teenager and not getting out of bed." Mandy, a nurse, contacted one of her daughter's closest friends at the height of that period to find out what was happening. In agreeing to tell her story to womens.afl, Alexander spent recent weeks informing some of those closest to her about her exhausting, confronting and private battle before they read about it. She remains unsure how she will react to more people knowing her personal business, but hoped sharing her experiences would help others enduring a similar struggle. Another Magpie, champion netball convert Sharni Layton, spoke publicly in July about her own mental health challenges for the same reason – and has been a confidante for Alexander. There were many different steps to this more positive point, but one of them was starting casual work as a teacher's aide at Ballarat Specialist School in mid-2017. Alexander's work status switched to full-time six months ago, overlapping with a breakout VFLW season for Collingwood that saw her make the competition's Team of the Year and win the club's goalkicking award. It was during one class that Magpies list manager Jess Burger broke the news by phone, in the weeks leading up to the draft, that they were going to make her AFLW dream a reality. Alexander knew a call was coming – and ducked out of the classroom to take it – but it wasn't until Burger said "We'd love to have you on our list" that she believed it was happening. The work and sport milestones were similarly significant in what has often been a difficult journey since Alexander's friends told her the feelings of "worthlessness" swamping her weren't normal. Her dramatic weight loss, more irritable self – "I'm someone who normally hates being rude" – and lack of interest in things she typically loved, such as basketball, were giveaways something wasn't right. Even so, Alexander looks back with appreciation at how alert her friends were to the signs. "I would have kept going the way I was going (without their intervention); just plodding along and not getting anything out of my life," she said. "That's why the change to football was quite a big deal, because it was outside my comfort zone. "I was playing basketball (for Ballarat in the South East Australian Basketball League and Horsham in the Country Basketball League) for all those years, just because it was comfortable, so without their influence I wouldn't have sought help." Football, with the newfound pathway for female players and its natural mateship, has performed a key role in Alexander's rehabilitation. She makes the 90-minute drive from Ballarat to training at Collingwood's Holden Centre several times a week with fellow Magpies recruit Lauren Butler, who lives in nearby Maryborough. Alexander's ascension to the AFLW began with a handful of appearances at the end of 2016 for Ballarat League club Redan, after the competition's creation inspired her to return to the field. She subsequently followed her friend, ex-Carlton defender Tahni Nestor, to then-VFLW team Eastern Devils, where she spent the 2017 season, before joining Collingwood last year. Two Magpies, VFLW coach Penny Cula-Reid and player welfare officer Paul Campbell, became major allies after Alexander's mid-season "meltdown", which coincided with her parents going on holiday. Coming home to an empty house for a couple of weeks, on top of her impending return to university, where she is studying a double degree in nursing and paramedicine, were the stressors. Alexander unwittingly dropped 9kg in a two-month period at the time. "There is a loss of appetite that comes with my anxiety. Some people eat too much, but I'm one who eats less and I don't notice I'm doing it," she said. "I won't eat breakfast, I'll definitely skip lunch and I'll probably just end up eating chocolate. It's not an active thing trying to lose weight. I don't have weight issues." Campbell suggested Alexander write her feelings down and buy a dog for company, while Cula-Reid introduced her to energy therapist and St Kilda's mindset performance coach Steph Warburton, who encouraged mindfulness meditation and more time outdoors. That compilation of emotions may even become a book down the track. Mandy, too, has put safeguards in place for next time she and her husband are away, whether it's Alexander staying with one of her sisters, Jessica, 31 next week, or Lucy, 29, or a particular friend whose home is "a happy place". Nowadays, you will regularly spot Alexander walking Ballarat's streets with her jet-black 'spoodle' – a cocker spaniel-poodle cross-breed – named Angus. She smiled as she relayed Angus' cheeky habit of stealing one of her runners almost every time she leaves for training. "He’s someone you don't have to talk to, but a presence. Someone is there with you," Alexander said. "He's just a little ball of energy. To go home and have someone so excited to see you every day is a very positive experience. "The other thing with Angus is I have to get up every day and feed him, so it regulates my eating, too." Alexander is slowly but surely figuring out, with the right help and support, what works for her. As another example, her standout four-goal performance last June against the Northern Thunder in Darwin came after she watched a YouTube hypnosis video designed to reduce anxiety. "You have to be on top of your game physically and mentally, so if you've got outside things impacting on the way you're playing, you're thinking about that as well as football," she said. "You'll always have your down days, but that's what the dog's for – he brings you back up. "I've been very lucky to be surrounded by great family and friends." If life is in danger, please call 000.